An interface and DAW package with low latency that could find a home in many project studios. Sounds impressive; low latency when running Studio One Artist. Not as versatile as it could be. The AudioBox 22VSL will prove useful for beginners. The 22VSL's preamps are quiet and add little colour to sound. AudioBox 22VSL from Presonus is a simple two input/output interface with MIDI in/outs and a killer feature that sets it apart in a crowded market: ultra-low latency. Testing the stereo outputs with a range of finished mixes the interface sounded remarkably natural - producers will be comfortable working with this interface for hours. "AudioBox 22VSL is a healthy sounding interface; recording through the Studio One Artist software will be a revelation for those who struggle with latency issues." Knowing many potential buyers of this package would be upgrading from their internal soundcards, we ran a simple A/B comparison between the soundcard on a MacBook Pro and the AudioBox 22VSL using Beyerdynamic DT250 headphones. A big difference in quality was obvious - the AudioBox 22VSL sounded demonstrably better with an impressively focussed stereo image and well defined high and low responses. The preamps are quiet and add very little colour to the sound, which at this price is exactly what you'd want. The included 'clip' LEDs are handy and shone brightly whenever we got a little too excited. And when comparing the results with an Apogee MiniMe and Mini-DAC, there were clear differences in sound - though not quite as much as we expected considering the vast differences in price. 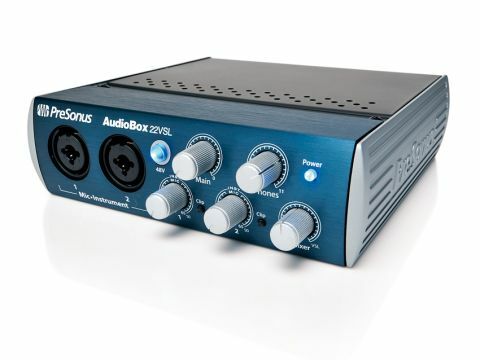 The AudioBox 22VSL comes supplied with Studio One Artist, PreSonus' DAW software. The review model shipped with version one, and on installation gave the option to upgrade to the current version two. Studio One Artist enables you to record audio and MIDI in much the same way as Logic, GarageBand and a host of other DAWs but with the added benefit of extremely low latency (around 5ms). Latency is the delay between audio arriving at the interface and being replayed through the speakers - a significant problem when working with digital audio. Even a small delay can throw performers off their take, especially singers, so anything we can do to reduce it in a pressurised recording session is welcome. Until recently, low-latency systems have been the preserve of high-end products such as Avid's Pro Tools, but PreSonus has successfully brought this facility to the cash-strapped masses. Recording vocals with the confidence of knowing your timing was spot-on is a thrill. The mix pot on AudioBox 22VSL gives you the essential facility to mix between the signal being recorded and current, but unfortunately the low latency is not available if you're using the AudioBox 22VSL with your regular DAW. Studio One Artist is a solid DAW that PreSonus are clearly putting a lot of effort into, and is certainly useful for those looking to take a step up from GarageBand. AudioBox 22VSL is a healthy sounding interface; recording through the Studio One Artist software will be a revelation for those who struggle with latency issues, and is ideal for a producer looking to record audio and MIDI quickly and with little fuss. We can see this package working particularly well for touring musicians who need a lightweight setup for capturing ideas on the move or even triggering samples on stage. And at this price it's highly affordable too.